In honor of the South End Art Hop in Burlington, VT this weekend, I thought I would write a bit about Art in the Landscape! You can view art in many different ways. From Dan Snow’s beautiful dry laid stone sculptures to Christo and Jeanne-Claude’s fabric installations and Patrick Dougherty’s stick structures. Who are each of these artists you might ask? Well, each of these contemporary artists are creating their amazing works of Art in the landscape right here in the USA. 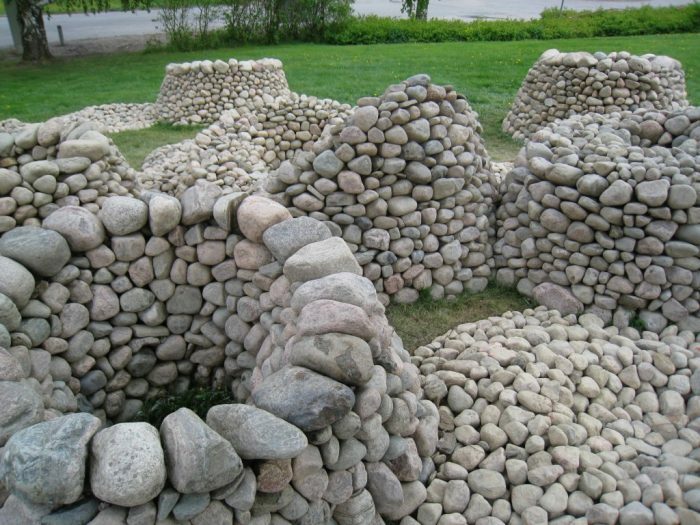 Dan Snow is a native Vermonter who combines old world stone wall building techniques with artistic vision. Dan is a Master Craftsman with the Dry Stone Walling Association of Great Britain. He assembles his work from stone that is locally sourced or stone found onsite. 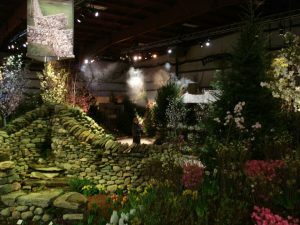 He teaches stone walling and environmental art workshops in the USA, Canada and Great Britain and was the featured artist at last year’s Vermont Flower Show. Click here to learn more about Dan Snow. Christo and Jeanne-Claude met in Paris in 1958 and began their artistic career together. They are installation artists who spend years preparing their visions to become a reality. In fact they spent 26 years bringing “The Gates” to life, and it was finally displayed in New York City’s Central Park in 2005. 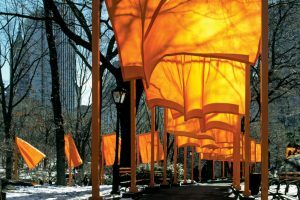 This installation consisted of 7,503 gates on which hung saffron colored fabric. These gates lined the paths of the park for only 16 days. But while there they completely transformed the park. All of their installations are only temporary and let the viewer see an ordinary landscape as something very different for a short time. Click here to learn more about Christo & Jeanne-Claude. Patrick Dougherty grew up in North Carolina and studied art history and sculpture. He learned primitive building techniques and combines them his modern carpentry skills. He uses saplings as his major building material. His work quick went from small scale to grand environmental installations which can be seen all over the world. Click here to learn more about Patrick Dougherty. And of course you can view the works of art we create in the landscape on both our website and on our facebook page each week! Happy Art Hopping everyone!